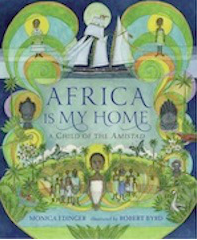 A Girl Called Problem got a brief but complimentary mention recently in Monica Edinger’s wonderful Horn Book article entitled, “Books about Africa.” Edinger is the author of the recently released and very well-received Africa Is My Home: A Child of the Amistad. In the article, Edinger offers a helpful survey of books that do (and sometimes don’t) help young folks develop an accurate and rich concept of the diverse and fascinating continent that is Africa. She makes the point that we could still use more good literature for young people set in this part of the world. Let’s hope if Edinger revisits the topic in a decade that she’ll have a lot more material to draw on! In the meantime, I strongly recommend her article. This entry was posted in A Girl Called Problem and tagged A Girl Called Problem, Africa, Africa Is My Home, Books About Africa, Horn Book, Katie Quirk, Monica Edinger. Bookmark the permalink.